For the past several years, Oracle sponsored an annual conference dedicated to supply chain management which was the Modern Supply Chain Management Experience 2019 (MSCE) which we have consistently attended in prior years. 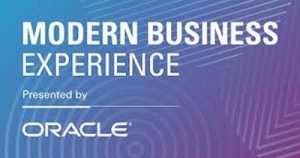 This year, rather than conducting separate events related to different business and functional audiences, Oracle made the decision to create a broader applications community conference that reflects more of a sense of integrated systems needs across business areas. In our Part One commentary, we highlighted a product announcement made in conjunction with MBX. In this commentary, we focus on the conference themes. Our Part Three commentary updated readers on new customer adoption milestones and developments for various application offerings within Oracle SCM Cloud. 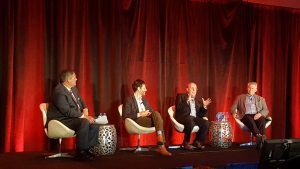 In this commentary, Editor Bob Ferrari highlights participation in the Supply Chain Executive Summit that occurred simultaneous with this conference. As with the former MSCE conference conducted in prior years, 200 senior supply chain executives were invited to attend a Supply Chain Executive Summit that was conducted in parallel to this week’s MBX. This year’s Summit was again jointly sponsored by Oracle and Deloitte Consulting. As we have noted in our annual predictions research series, industries are transforming from chains to highly connected supply and demand networks. That observation was reinforced by Deloitte. An executive from Deloitte client Titan International, a provider of both Titan and Goodyear Farm Tire branded wheels, tires and undercarriage products for a wide variety of off-the-road equipment described an ongoing Cloud based systems transformation. Among lessons learned thus far, active change management practices and an experienced partner are key to a smooth journey. We heard about Oracle’s own SCM Cloud transformation for its legacy Sun Microsystems IT hardware business lines. That was described as: “Drinking our own Champagne,” a novel term. Computer hardware demand emanates from outside customers along with Oracle’s global based data centers. In closing the Summit agenda, there was a panel discussion addressing ongoing digital transformation. John Shorter, Vice President, ERP and SCM Cloud Transformation at Oracle (First left to right in photo) served as our panel moderator My fellow panelists panel members included Rob Owen, Senior Manager, Transportation Network Optimization, Mondelez International, Inc. Rob described a recent high visib ility upgrade to Oracle Transportation Management Cloud. The business purpose was a series of acquisitions that brought a collection of different on-premise TMS applications that needed to be brought together. Like many other consumer products companies today, grocery retailers and wholesalers demand more agile transportation management and routing practices insures that their operations are efficient. Ongoing significant increases in transportation costs additionally provide the impetus for change, and the need for a singular core of operational transportation management and decision-making capabilities across regions. David Rudzinsky, Senior Vice President and CIO, Hologic, Inc. (far right in photo) has been in his role for over 19 years, a rarity in today’s management scene. Over this period, there has been an explosion of Hologic’s growth in the market and with addressing added needs for business process scalability and more integrated decision-making based on the most up-to-date information. He described some of that success in viewing Oracle as first and foremost a business partner in addition to a technology provider. That partnership included continual updates to existing on-premise Oracle E-Business Suite Applications while assisting with Hologic’s ongoing phased transition to the Cloud. My contribution was to describe for our audience that disruption today is more outside-in driven and that in the current environment of high levels of heightened global risk and uncertainty, that technology transformation has to have a solid business case. It most include a broad vision, but at the same time, a series of manageable milestones that deliver meaningful incremental benefits in productivity, higher service levels and cost savings. The Cloud model provides important considerations in each of these objectives not the least of which is the ability to tap a continuous cycle of quarterly based process innovation. A further consideration is the elimination of legacy IT data center and escalating systems support costs, coupled to enhanced information security. Regarding the current “buzzword dejour” of Blockchain, while the underlying platform technology needs to overcome current constraints, there are a number of trust and verify use cases across multiple industry supply and demand networks. Thus, I anticipate an ongoing period of pilot implementations where additional learning and added platform and business process enhancement will occur. First movers will benefit from such managed scope pilots but mainstream use of blockchain remains 1-2 years from today. Internet-of-Things, AI and machine-learning are further along in specific business case deployments. Supply chain management teams have consistently evaluated and deployed advanced technology to support well defined business cases and after assessing the strengths or tradeoffs of such technology. As stated earlier, these are the roll on, or roll-off actions needed to enhance everyday supply and demand network operational management and decision-making needs. While technologies are indeed becoming more powerful, the readiness factors are broader in terms of people and process considerations. All of these new technologies, individually or linked will have an impact, the question is timing and readiness. I was asked to provide an example of an industry that has been disrupted and transformed by technology. That industry, for me, is major league baseball. The disruption occurred in 2002 and was described in the movie Moneyball, based on the book of the same name. Oakland Athletics General Manager Billy Beane empowered a data analytics professional to determine the probability of key success factors among available players for drafting vs. traditional scouting. That formed the basis of transforming the league’s front office management capabilities for recruiting players with maximum potential and team balance. Flash forward to 2018, and the Boston Red Sox recruiting of manager Alex Cora. Among his coaching abilities was an enthusiasm to embrace analytics in day-to-day game management. Cora went on to be one of very few managers to take his team to a World Series Championship in his first year as manager. There is one specific example of change management which I describe. Call me and I’ll gladly share that moment. Stay tuned to the Supply Chain Matters blog for additional updates including our summary of highlights from the 2019 Oracle MBX conference.